I was back in Germany recently, and found that the food is as good as I remembered. 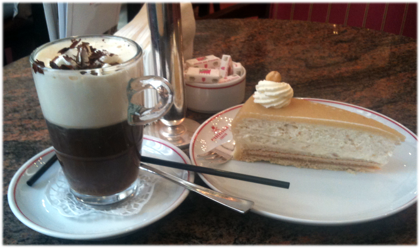 Two highlights: the Cafe Niederegger's Nusstorte (see the picture below with a coffee/cream/chocolate serving, the Nusstorte was covered before) and I actually found a quite good Sushi-place called Mijori Sushi Bar. 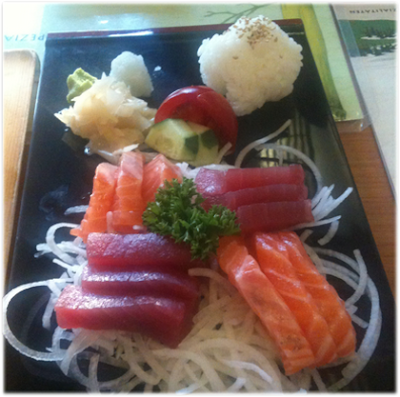 Below is a picture of the small Sashimi plate, all fresh and tasty. We had also some rolls and soup.